When their food supply is constantly being stolen by the greedy bears, the bees ask for help from Nanabush. They are given the stingers to defend their honey, and the bears learn not to be so greedy. 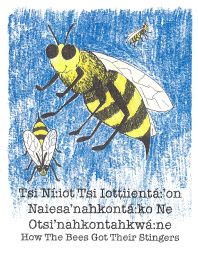 Adapted by Tewateronhiákhwa Mina Beauvais, illustrated by Katlatont Brenda Gabriel-Doxtator.